FEMALE VS. MALE SHOPPERS AT MACY'S/ A look at Product placement and consumerism at Macy's Department Stores. Though many students long for an assignment that can implement their definition of "enjoyment", there are none so, for the average USC student other than: shopping. An ingenious idea! This week we can justify shopping and disguise the activity as homework. This time, when parents rant uncontrollably about bills, no lies have to be told, we are definitely shopping for a good reason: to study the concept behind consumerism. Consumerism is defined as the theory that an increasing consumption of goods is economically desirable; also: a preoccupation with and an inclination toward the buying of consumer goods. To study consumerism, interviews with store managers and employees are needed in order to learn in dept information that is otherwise not available to public knowledge. Although there are many stores to choose from, I chose Macy's, a department store whose early beginnings and growth developed purely from consumerism. First an examination of the beginning and growth of Macy's as a department store must be made. Macy's role in American culture has evolved remarkably since Zaccheus Macy and his family operated their first store on Nantucket Island. Throughout the late 1700s, Macy's store filled the general needs of the American whale men. While the clothing selection has most likely changed a bit, the retail structure that made Macy's work was already in place. 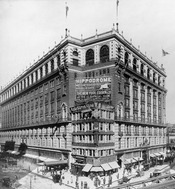 It was not until his grand son, Rowland H. Macy founded a general goods place in New York City in 1857 that Macy's began to obtain an unusual position of prominence among American retailers. Over time, the stores it opened became larger and larger. As they grew in size, they began to divide into sections specializing in certain kinds of products, for example women's clothing in one store section and in another, thus the department store was born. WriteWork contributors. "FEMALE VS. MALE SHOPPERS AT MACY'S/ A look at Product placement and consumerism at Macy's Department Stores." WriteWork.com. WriteWork.com, 05 October, 2004. Web. 25 Apr. 2019. Not clear organized. It doesn't have thesis statement. Some of the ideas are poorly expressed.